Elizabeth Mears as of 5/2/12, a photo by Nicole's Needlework on Flickr. I'm almost finished! I just have to do the zig zag stitches on the top! Nicole, your "Elizabeth" gets more and more lovely! So pretty. ~ I love the colors on this! Oh that's so exciting, Nicole!!! I so need to order the silks for this one. It's just so gorgeous! 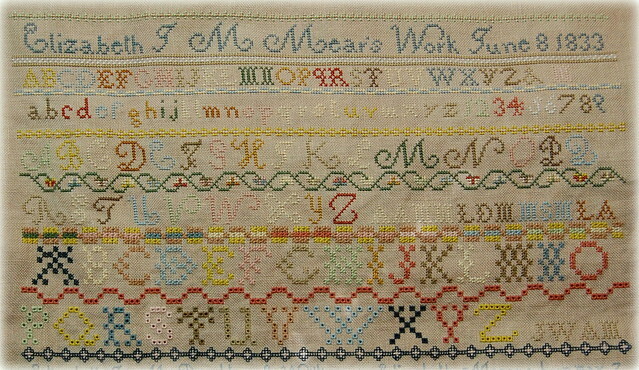 This is a wonderful sampler with beautiful colors!I love it! Elizabeth is smiling from above. So lovely! Woo Hoo Nicole!! It's beautiful and I know that you're looking so forward to putting the last stitch in! Can't wait to see the big finish! She looks great. I like the clean simplicity of this piece. Very nice. Your Elizabeth Mears is gorgeous Nicole! What a beautiful almost finish. Nicole, it's so stunning! Beautiful work! Love it! That eyelet alphabet is phenomenal. So pretty! Go Nicole, go!!! She is a beauty. SO so very beautiful. Spend quite some time drooling over Elizabeth's picture. Gorgeous!!!!! She's just so pretty. Oh I love it, Nicole !!! Those colors are just beautiful.